Personalised tours cater for all enthusiasts ranging from first time beginners to serious enthusiasts. This tour is conducted in the comfort of a new Toyota Prado as a boutique concierge type service. Would you like to witness the courting display of the Golden Bowerbird? Watch the male building the fruit and lichen decorated bower, then call out to prospective partners? A view of this rare and elusive species is offered only June to December. Other bowerbirds that may be sighted on the Tablelands are the Spotted Catbird, Tooth-Billed Bowerbird, Great Bowerbird and Satin Bowerbird. May to December is the time to watch and film Brolgas and Saurus Cranes dancing, displaying, flying and feeding. A multitude of wetland birds live on the Tableland lakes,swamps and rivers if you know where to look for them. 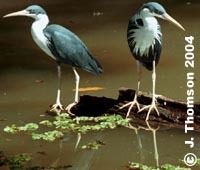 Some favorites are the Comb-crested Jacana, ducks, grebes, kingfishers and herons. Watch for platypus in the morning and evening. 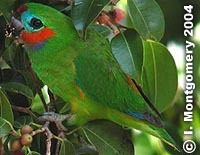 At different times of the year 10 species of parrot live on or visit the Tablelands including Red-tailed Black-Cockatoo, Rainbow Lorikeet, Australian King Parrot, and the Pale-headed Rosella. These delightful birds are a joy to watch in their own habitats and present such a contrast to the behaviour of caged pets. Ask us about the best time of year to see Double-eyed Fig-Parrots (pictured at right).